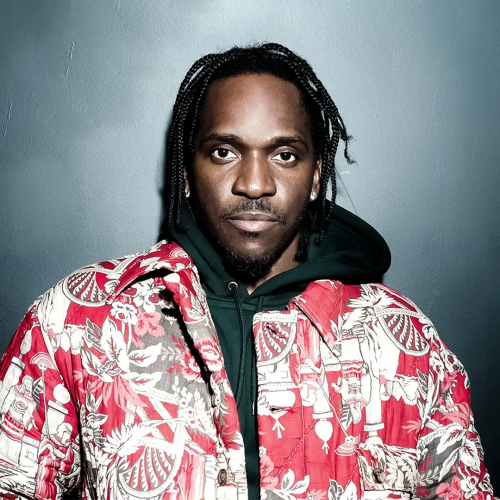 Pusha T (born Terrence Thornton on May 14, 1977 in Bronx, NY) is a recording artist, occasional actor, and one half of the critically acclaimed hip hop duo Clipse, which formed in 1992 from Virginia Beach, Virginia. He is also the co-founder and co-CEO of Re-Up Records along with his brother Gene "Malice" Thornton, the other half of Clipse. He has since relocated to Norfolk, Virginia where he and his brother were raised. In September 2010 he announced that he has signed to Kanye West's G.O.O.D. Music label. Following this signing, he was featured on a number of labelmates' projects such as My Beautiful Dark Twisted Fantasy and many of the G.O.O.D. Fridays tracks. On March 21, 2011, he released his first solo mixtape, Fear of God. He has completed his EP Fear of God 2: Let Us Pray which has yet to be released; its original release date of June 21, 2011 was canceled and no new date has been announced yet. He is also working on his debut solo album, yet to be titled, which includes tracks produced by The Neptunes, Kanye West, Bangladesh, Ryan Leslie, and Alex da Kid. Pusha T has stated that after his solo album and the Re-Up Gang mixtape, Long Live the Cane, he and his brother Malice will release another Clipse album. On July 8, 2011, the first single from Fear of God 2 was released to the Internet. The song, titled "Trouble on My Mind," features Tyler, the Creator and a music video was released July 20. As for his acting career, he is set to appear on four episodes of the second season of the HBO series How to Make It in America, on which he will be playing the role of a drug dealer.